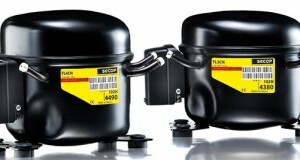 Reciprocating compressors (also known as piston compressors) are generally used to move gas at increased pressure. The main elements of the compressor are one or more cylinders, and pistons which move within them, rather like in an internal combustion engine. The action of compressing the gas will also produce an increase in its temperature. Gas is drawn into the cylinder through the intake valve (or valves) when the piston draws back, and the gas is then expelled at pressure through the exhaust valve when the piston returns. The pistons are moved by a crankshaft which can be powered by an electric motor, a petrol engine, or any other suitable rotary power source. Cylinders are often paired on opposite sides of the crankshaft so that the movements of the pistons oppose each other. Reciprocating compressors have many uses in industry, including natural gas processing and delivery, chemical plants, and oil refineries. Compressed gases also play a major role in refrigeration technology, where the subsequent re-expansion of the gas after compression produces the required cooling effect. Many compressed air applications use reciprocating compressors, in settings as diverse as diving, dental surgeries, automotive workshops, and agriculture. Pneumatic (air-powered) tools, such as drills and angle-grinders, are important in industry because they are generally lighter and safer than those with an electric motor. Reciprocating compressors are regarded as the most energy-efficient type of compressor for most applications other than those involving small amounts of gas. However, they tend to have a higher maintenance requirement than some other compressor types, so expense calculations need to balance energy against maintenance costs. A primary maintenance issue is the need to prevent gas leakage past the piston head, which means that piston rings need to be replaced regularly. In this new type of reciprocating compressor, the piston compressing the gas is made not of metal, but of ionic liquid, a kind of fluid salt whose use in compression technology owes much to recent work by British scientists. The liquid piston greatly reduces the need for seals and bearings and dramatically improves the efficiency of the compressor. This technology is particularly effective in dealing with highly volatile gases such as hydrogen, and will probably become increasingly important in the future.